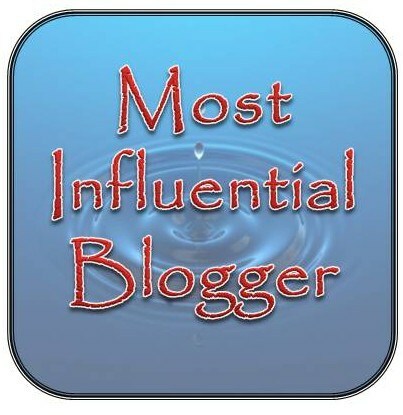 I feel very honored to receive this WordPress Family Award…it is a blessing to be part of a blogging community that cares so much about each other, not just as writers, but as human beings! I have grown leaps and bounds, first, as a person and then as a writer, from the interaction that has taken place since I began writing on this blog site, October 14, 2011. I have experienced so much deep joy in the words that others write…in the honesty in which they portray their thoughts and experiences…in their relentless care and concern for each other as gifted human beings on our Mother Earth. A very good friend of mine, Elaine, said I should surround myself with “gentle beings.” I think becoming a part of the WORDPRESS FAMILY has given me that opportunity! 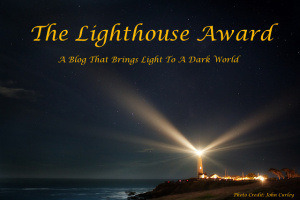 I have met so many wonderful and good people on this blog site: writers, poets, photographers, artists! I have been blessed so much! Many times during my life I carried with me the thought of Sir James Barrie, the Scottish novelist and playwright, who penned Peter Pan. He wrote these words: “Those who give sunshine to the lives of others, cannot keep it from themselves.” I do not always succeed, but I try to live these words. Perhaps, that is selfish…because I am seeking happiness…however, I think it means that by giving to others, I am being who I am meant to be….and that helps me to live happily. I think this is true of the WordPress Family. We pass rays of sunshine and love crystals to one another in our gift of affirmations and comments! How blessed we all are! I am full of gratitude for each of you! And especially for dear Patty! Thank you, Patty, [ http://petitemagique.wordpress.com%5D for your nomination! I am truly honored! and dear Shaun, my gallant knight! and my younger brave heart, Shane…dear sweet son! You inspire me so with your generous spirits and good hearts! Shaun is the Gallant brother…always looking out for everyone! Patty is the Courageous Woman Princess…always so kind and gentle…compassion rules her being! Shane is the Knight of Thought…thinking deeply about the meaning behind all that is read! Tersia is the Mother Beautiful…obvious…read her blog! A woman of great courage and strength! Dace is my Sister of Courage. Such deep beauty and truth in telling of her story…so unselfishly written and bravely –so as to help others and not only herself. She succeeds! Suzie…Courageous Photographer….delicious perspective in the photos she takes! and a person of courage to be who she is! Sabatino is the Knight of Truth…..writes from the truth of his heart…his writing is so clear and focused…and beautiful! Sheri is the Princess of Enlightenment with her excellent book reviews and well-researched insight on matters of humanity! Stephanie is the Mother of Bravery…she speaks of her loss but also of her resolve to move forward and find a new way to live! Kamlesh is a Knight of Courage…he blogs in a Second Language…English is so very different than Hindi…he is so brave in his execution of this goal! This Master is a Knight of Mindfulness…his blog teaches the way to find peace within ourselves. Sumithra Sriram is the Princess of Possibility as books, music and travel are the loves of her life at present. Her writing is refreshing! I would like to thank all my friends and followers for their support, comments and awesome posts! ありがとう, Yoshiko! Arigatō Thank you! I appreciate the award…and will reply to it as soon as I am able. 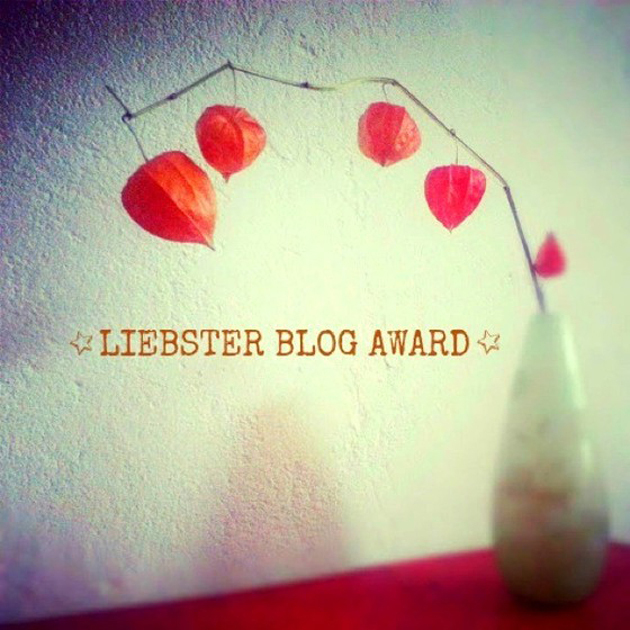 You honor my writing…and who I am with this award. Thank you! Sorry about your loss of loved ones.It must have been difficult for you.I am happy that Word Press helped you to meet wonderful people .May your life filled with colors..
thank you for the wishes of colors…i love all the colors so very much! thank you for your words of sympathy…I know that they are with the GOD of LOVE…I miss them so much…but I try to carry their message of love to others…it is the only thing and the best thing I can do to honor them! thank you so much for your kind words, M M Mohan! Thank you dear Jane!! This is an amazing award to receive!! Thank you for your beautiful “intro”. Tersia, YOU are most welcome! Your strength keeps me going! I so admire YOU! Arigatō! thank you! You are so kind! and your WordPress site is comforting! You deserve it! I love what you write and the award is for you this time. Congratulation!! Merci beaucoup, Mich! You are so kind! Vous êtes tres gentil! Truthfully, I am amazed at what you write about me…I can hardly believe it…I cry when I read your words to me…thank you! WOW!You are quick with the work! Love your humor! May you have many love crystals to heal all the pain that you experience! Aw man, thank you so much for the kind words and for reading! This was exactly what I needed tonight. Cheers! May you find love crystals surrounding you, Sabatino! Take care! You are loved–believe it and it will find you! Thank you so very much! It is an honor! Thank you for visiting my blog and for the reognition! I am working on the nominations! Congratulations on the award and recognition, Jane. 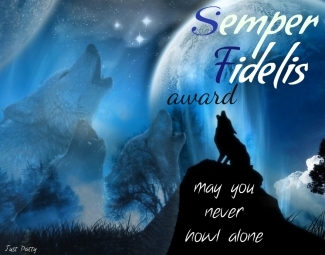 Jane – You do such a beautiful presentation of the awards. 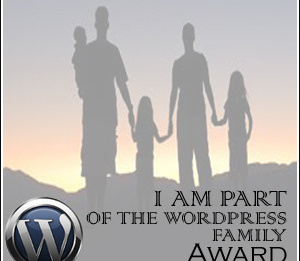 Congratulations on receiving the WordPress Family Award and thank you for passing it along to me. I see we know a few of the same bloggers and I’ m anxious to check out the others. Sheri~ thank YOU for your words. I know how important it is to receive comments/affirmations of what we present on our blogs. I know how much it has helped me as a writer and as a person. 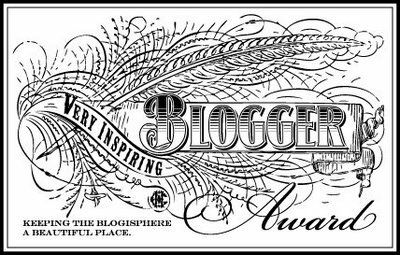 I make the extra effort to read each blog I award…and I am gifted again when I do that– I marvel at their beauty and depth! WordPress certainly blesses us with so many wonderful writers!